This is the place for timely troop announcements, outing & activity details and news blurbs. Check back often for changes and updates. Posted 06/14/17 — 9th Annual Frank McCluskey Friendship Outing (Fri, Sat & Sun 06/23 –06/25), Canoe the Delaware River and Camp at Ten Mile River, Narrowsburg, NY. Meet at Tuckahoe Community Center @ 7am Sat 6/24, depart @ 7:30am sharp! It is very important that we check in at Lander’s Canoe Rental by 10:30am! Cost = $75/person, $50/guest ($50 Non-refundable). Bring bag lunch and snack for Saturday in waterproof bag (2 gallon freezer bags). Note: there is a small group going up Friday night 6/23 and as of 6/14/17, no additional seats are available for early departure on Friday. Monday June 19 – Signup deadline. All invited guests must provide $50 deposit (check payable to Troop 353 Eastchester), completed Invitation Form (see link below) & completed Medical & Release Form. All forms & deposits must be submitted by Monday 06/19/17 to Adult Event Co-Coordinator Steve Ecklond – Ecklond@aol.com. Cancellations after June 16th results in forfeiture of $50 deposit due to pre-event required troop non-refundable deposit. Thursday June 22 – Swim Test & Canoe Orientation. All attendees, including guests, must attend the BSA Swim Test AND Canoe Orientation & Paddling session at the Lake Isle beachfront on California Road on Thursday June 22nd (5:30–8pm). ALL attendees must bring their completed Lander’s Liability Release Form to these Lake Isle beachfront sessions. Prior to the Saturday morning June 24th departure, please print out the 2-page Parent / Leader’s Guide (see below), read and bring with you, as it includes contact info, the itinerary, driving directions, advanced preparation requirements and other helpful information about river and this outing. Posted 03/01/17 — Wintoree Advancement Campout @ Camp Durland, Putnam Valley, NY, Saturday March 4th–Sunday March 5th. Please arrive Tuckahoe Community Center (TCC) no later than 6:45am, as we are departing at 7:15am sharp. The merit badge seminar opening flag ceremony will be @ 8:30am sharp outside the cabins at Durland. Brown bag lunch for Saturday. Annual Merit badge and First Class Advancement weekend with Riverdale Troop 240, Troop 414 NYC & Troop 2 Bronxville. Heated cabin Camping in Jones, Nardone, Birch Cabins. Bring your mess kits and a refillable bottle for beverages. Class A uniforms (with neckerchiefs) will be required for Saturday dinner (only). Wear layers and be prepared to be outside as it will well below freezing! Ensure all gear is labeled with your initials. Cost for the Wintoree is $25 per person (Scouts & adults) for those staying for dinner (includes cabin rentals). Any scout wishing to tent camp for Camping merit badge must be properly prepared and have prior approval from Assistant Scoutmaster David Kindberg or Scoutmaster David Flannery. In conjunction with our Council’s advancement policy change in 2015, scouts will be limited to completing 4 merit badges. All scouts must have read and studied their merit badge booklets thoroughly. Scouts should not assume they can use their completed worksheets to answer requirements when quizzed by the MB Counselor, which means scouts must truly learn the material. In order to allow adequate time to learn the material presented for each merit badge, all scouts must review with Mr. Beirne which merit badges they want to take by March 1st, at which time they will receive their signed blue card. Evidence of completion of all the merit badge requirements in advance of the Wintoree. In your possession a completed Merit Badge Workbook/Worksheets to demonstrate you know the material and have completed each of the requirements. You will not have access to your completed worksheets when being quizzed by the MB Counselor, so be sure you know ALL of the material. Otherwise, the scout will be given a partial completion. Prepared to listen, learn and have fun! Senior scouts from both T240 & T353 will be working together to coordinate activities this weekend (assist with First Class emphasis, flag ceremonies, bonfire, etc). Over 60 scouts plan to attend. Troop 353 scouts must be prepared with at least 5 well-rehearsed skits! If you intend to arrive Friday night for extra camping nights for either Order of the Arrow eligibility or Camping merit badge, you must contact the ASM David Kindberg by Thursday March 2nd. 02/06/2017 — Annual Ice Fishing and Winter Recreational Outing, Ten Mile River Scout Ranch, Narrowsburg, NY, Saturday Feb 10th–Sunday Feb 11th. Signup Deadline = Sunday Feb 5th. Depart from Tuckahoe Community Center (TCC) as close to 7:30am Saturday as possible (scouts should arrive 7:00am sharp); Returning Sunday Feb 11th to TCC by 2pm. Cost is $50 per person. Scouts will need healthy snacks & water in their day-pack for outdoor activities. Ice Fishing and /or other Outdoor activities are planned all day Saturday (bring small sled). It will be very cold, so dress warmly. Warm and waterproof winter clothing is mandatory–we will be outdoors all day Saturday. Monitor forecast for Monticello, NY–see below. Old Goat patrol will prepare a traditional turkey dinner for everyone Saturday night. It is imperative that parents & scouts initial all clothing articles for this cabin camping outing. Important additional event details are found in the two print-outs below–please read thoroughly. Posted 12/09/16 — POSTPONED. Mountain Lakes Park, North Salem, NY, Dec 10-11, Meet at TCC at 9:00am sharp for equipment check-out & depart at 9:30am. Cost = $25/person. Bring daypack with Boy Scout Handbook, healthy bag lunch and snack for Saturday, unless someone in your patrol is cooking 3 meals for 1st Class advancement. Scouts will be sleeping in Cedar and Balsom lean-tos and tents if needed. Mountain Lake Parks is very hilly, so hiking will include some scenic overlooks, including the highest point in all of Westchester County at 982′. A night hike to this nearby peak is very possible given that a full moon will occur within 3 days and the current forecast for a clear night! (see below). Winter temps 20–30 degrees. Posted 11/14/16 — Durland Scout Reservation, Putnam Valley, NY Nov 19-20, Meet at TCC at 7:00am sharp for equipment check-out & depart at 8:00am. Cost = $25/person. Bring daypack with Boy Scout Handbook, healthy bag lunch and snack for Saturday. Older scouts will practice wilderness survival skills and newer scouts will also focus on winter camping basics, including the all-important firebuilding task! If a senior scout would like to sleep in their shelter, you must get approval from ASM David Kindberg to review needed gear to stay warm. Please print out the 2-page Parent / Leader’s Guide, read and bring with you, as it includes contact info, the itinerary, driving directions, advanced preparation requirements and other helpful information. Posted 10/16/16 — North South Lake, Haines Valley, NY (near Hunter Mountain) Oct 22-23, Meet at TCC at 7:30am sharp for equipment check-out & depart at 8:00am sharp on Sat. Oct 22nd. Cost = $45/person, ($35 camping + $10 cash lunch Sunday). Bring daypack with Boy Scout Handbook, healthy bag lunch and snack for Saturday. Scouts & parents will have opportunities to backpack/hike the Escarpment Trail with unparalleled scenic views of the Hudson Valley, bouldering and low-grade rock climbing, and canoeing or kayaking (additional $25 rental, PFDs required) and fishing (license required if 16 or older). Scouts must be 1st Class swimmers or paddle with adult that has completed Safety Afloat training & has passed 1st Class swim test. On the way home Sunday, scouts will have opportunity to visit Kaaterskill Falls (highest in NY state) & should return back to the Tuckahoe Community Center by 3pm at the latest (traffic permitting). We will stop in Saugerties to pickup lunch for ride home. Please print out the 2-page Parent / Leader’s Guide, read and bring with you, as it includes contact info, the itinerary, driving directions, advanced preparation requirements and other helpful information about the park. Posted 09/22/16 — Algonquin District Shooting Sports Weekend (Sat & Sun 09/24–09/25), Durland Scout Reservation, Putnam Valley, NY. Meet at Tuckahoe Community Center @ 6am, depart @ 6:30am sharp! It is very important that we check in at Durland by 7:15am! Cost = $15/person (incl ammo, patch & food). Bring bag lunch, ample water, and high protein snacks! Troop is tent camping Saturday night (great weather!) and will return before 12 noon Sunday. We may also need drivers to help get the scouts up to Durland Saturday, and back from Durland Sunday morning. Given the early departure time, we will be extra appreciative of any driver who can help out. If you can drive in either direction, please contact Bob Share at 914-912-7827 or robertshare@optimum.net. Posted 05/25/16 — 8th Annual Frank McCluskey Friendship Outing (Sat & Sun 06/25 –06/26), Canoe the Delaware River and Camp at Ten Mile River, Narrowsburg, NY. Meet at Tuckahoe Community Center @ 7am, depart @ 7:30am sharp! It is very important that we check in at Landers Canoe Rental by 10:30am! Cost = $70/person, $50/guest ($50 Non-refundable). Bring bag lunch and snack for Saturday in waterproof bag (2 gallon freezer bags). June 15 – Signup deadline. All invited guests must provide $50 deposit (check payable to Troop 353 Eastchester), completed Invitation Form (see link below) & completed Medical & Release Form. All forms & deposits must be submitted by Tuesday 06/15/16 to Adult Event Coordinator Steve Ecklond – Ecklond@aol.com. Cancellations after June 15th results in forfeiture of $50 deposit due to pre-event required troop non-refundable deposit. June 17 & 18 – Swim Test. All attendees, including guests, must attend the BSA Swim Test AND Canoe Orientation & Paddling session at the Lake Isle beachfront on California Road either on Friday June 17th (6–8pm) or Saturday June 18th (3–6pm). ALL attendees must bring their completed Lander’s Liability Release Form to these Lake Isle beachfront sessions. Prior to the Saturday morning June 25th departure, please print out the 2-page Parent / Leader’s Guide (see below), read and bring with you, as it includes contact info, the itinerary, driving directions, advanced preparation requirements and other helpful information about river and this outing. Stephen was a tireless servant in our community, in his church and of course in the scouting program. For our troop, he served the role of Advancement Chair during a 5-year period of tremendous growth with distinction. He has been a devoted Tuckahoe Village Trustee the past five years and he was the founding President of the Tuckahoe School Foundation. His wonderful smile and cheerful helpfulness will be missed but are inspirational to us all. Posted 11/29/08 — TV Show Host (and Eagle Scout) Mike Rowe of “Dirty Jobs” offers free letters to Scouts about his perspective on attaining the rank of Eagle Scout–Please Read! 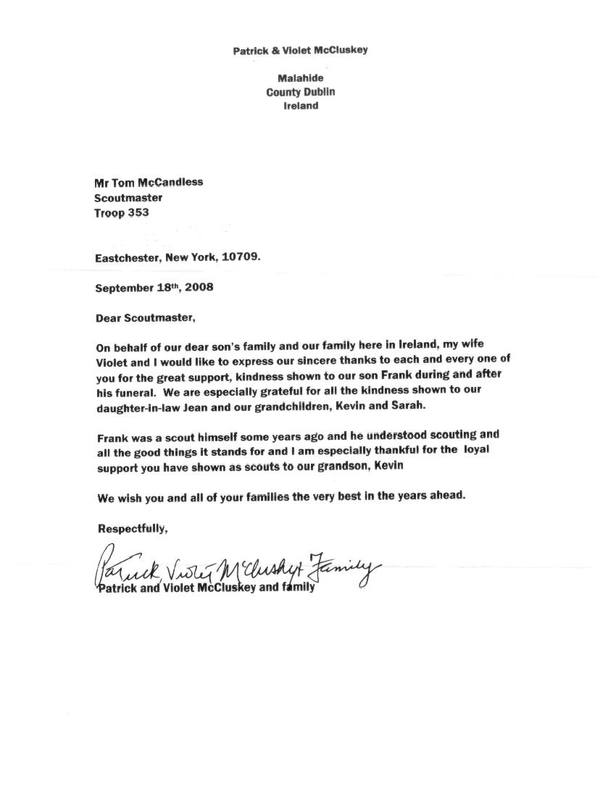 Posted 09/23/08 — Thank You note from Frank McCluskey’s parents. Everyone should read the wonderful and gracious thank you note from Patrick & Violet McCluskey from Ireland. It is never too late to leave your thoughts about Frank in the “comment” section of the “In Memoriam” story posted on April 16, 2008. Truly, Frank lived his life according to the Scout Law & Oath and the Golden Rule.